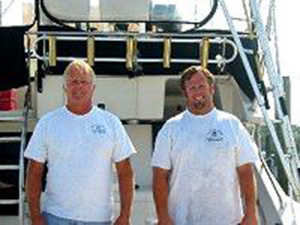 Knot Tied Down is a family owned business with over 30 years experience in fishing off the North East Florida Coast and our mission is to provide you with the very best in Offshore Fishing. You will have the full attention of the Crew to assure you have a safe and enjoyable day. Capt. Jerry Butler, Sr. and Capt. Jerry Butler, Jr.
Catch our latest fishing photos, videos, recent charter fishing posts and angler's comments on our Facebook page. Copyright © 2015 Knot Tied Down Fishing Charters. All Rights Reserved.